Did you know we have our own Ranch Dressing you can purchase ? Bosses Ranch and Red River Ranch is a recipe unique to Bosses. Since 2004, we have pride ourselves in making the best ranch in Texas. Our ranches are made with real buttermilk and mayonnaise, its the real deal! Our homestyle ranches are made to be poured, dipped and enjoyed on any kind of food. Grab a true Texas brand with Bosses! Bosses Buttermilk Ranch is just how your mama made it. Made with the highest quality mayonnaise and buttermilk, Bosses Buttermilk Ranch has the perfect home-style flavor. Our Ranch is made to be poured over your favorite foods. Equally a great dip! Look for the Bosses brand in the produce section with the other cold dressings. 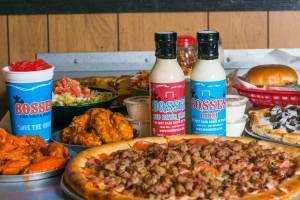 Bosses Buttermilk Ranch is a family tradition made readily available to you. Bosses has you covered from the dinner table to the watching party for the big game. Grab a bottle of the best darn ranch in Texas. Keep refrigerated. Shake well and pour over desired food. Bosses Red River Ranch is ranch with a kick. Made with the highest quality mayonnaise, buttermilk and secret blend of spices, Bosses Red River Ranch is truly one of a kind. This product has some heat to it! Our Ranch is made to be poured over your favorite foods. Equally a great dip! Look for the Bosses brand in the produce section with the other cold dressings. Bosses Red River Ranch is a family tradition made readily available to you. Bosses has you covered from the dinner table to the watching party for the big game. Grab a bottle of the best darn ranch in Texas. What, you want some delicious Dressing? 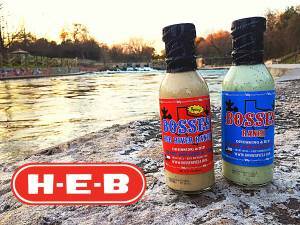 If you would like to purchase some Bosses Ranch or Bosses Red River Ranch, then you can stop by HEB for your own bottle. Located in the produce section with the cold dressings. Or if you would like to shop online, click below.